I've talked before about work clothes, and fave patterns for dresses and skirts for work. But honestly, most of the time I wear straight or skinny pants and something relatively interesting on the top layer, and I like long sleeves because my arms get cold pressed against my desk. But, I really, really don't like black, particularly in structured or formal clothes, and so I try to keep it light and fresh for work! Especially this time of year--I am sooooo tired of wintery colors and warm clothes! This week has been teasing us with hot sun and then cool rainy days, but I still want to keep the spring feel going. So I've been wearing the flares I made into straight pants a lot recently. 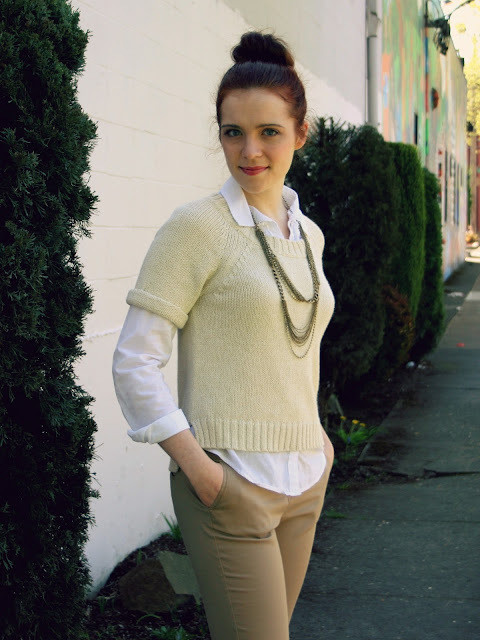 And I found this comfy, boxy Banana Republic sweater at Goodwill the other day, half off. Not my usual shape but I really have fun with it! It's an easy look. Specially when add a "tranquil" effect to the pics... trying out PicMonkey for editing! Blouse: Old Navy. 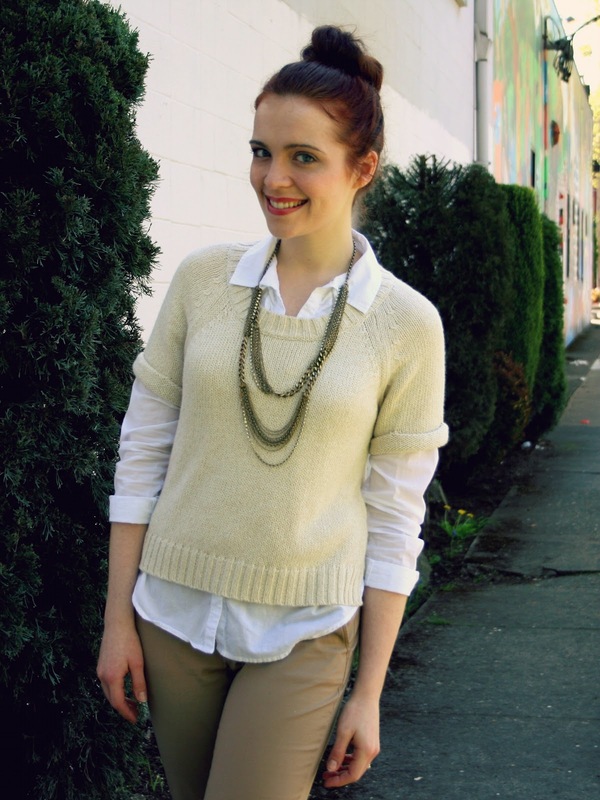 Sweater: Banana Republic (similar). Flats: JC Penney (similar). Necklace: Forever 21 (similar/similar/similar). 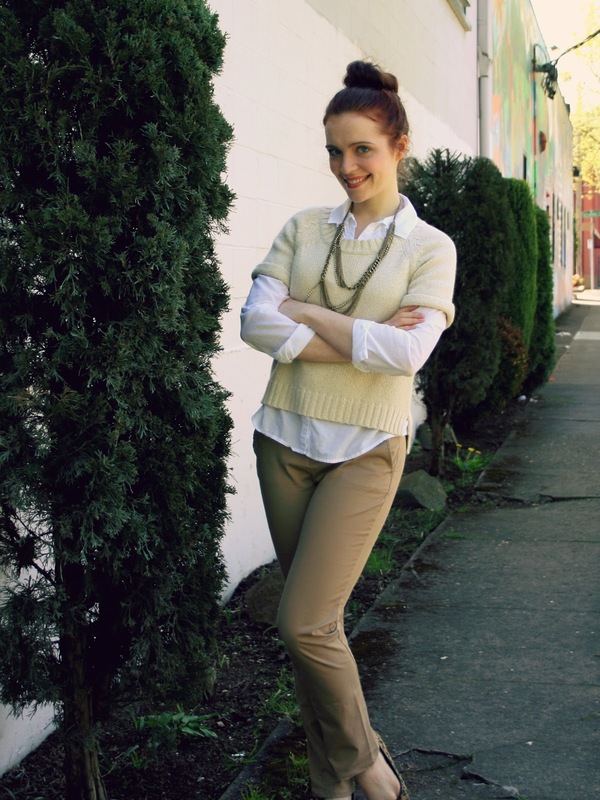 Pants: DIY, from flares! Yep, that's what I look like at work most days! How about you? Do you ever wear DIYs to work? I work in an arts centre which has an unofficial memo: wear black! Every now and then I got very bright & colorful just to rattle their cages! Wow, sounds like you'd have to! Too much black can be a little dull! Hey, congrats! That's great. I don't wear too many dresses to work because so often my dresses are so playful! Yes, I try to wear the clothes I've made to work at least a few days a week and I'm trying to also think more about what I need for work when I'm sewing - rather than just making more dresses :-). I work in a corporate environment, so I don't wear anything too crazy looking or party-like to work - but there's still plenty of scope for 'me made'. Very cool! Yep, dresses are my fave to make but don't always lend themselves to work. I feel ya. i love this look!! very cute! This look is so cute! I just bought a cheap pair of white denim flares from target (70% off of course) that I plan to turn into straight leg jeans soon. Ooh, sounds awesome! I love white jeans! CUTE!! I love these simple, classic looks. They will never stop looking good. Also layering things over a plain white button down = my current obsession. Thanks! Good point, I love classic looks, too! Since I recently lost 30 pounds and need all new clothes, I go to dollar day at Goodwill every week and have been have a ton of fun refashioning clothes. I don't know why I felt I need ten pairs of jeans, but I either cut them off into capris, or just above the knees with a cuff, or make them skinny. So cute. By the way, you should have been a model. Such cute poses. Nice outfit.. simple but classy. Thanks for sharing wonderful ideas and tips on dress making.